Meet at the clock tower from 9:30-10 am for check-in with Tamie Glubrecht. April 19th will be the closing day for using allotment money for students. After April 19th you can still sign up until May 3rd, personally paying for all attendees. All registration ends May 3rd. Thank you! Come join us for a historical walk through Spokane. 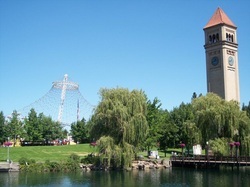 You will be guided through ten significant areas that make Spokane such a wonderful place to live. You will be divided up into 7 teams of 10 students with at least 2 parents, a map, and a simple "scavenger hunt passport" to complete for a reward of ice cream. The walk is 2 miles in length and on mostly even ground. Strollers are welcome. You will be creating your own walking groups of 10-15 people when we meet at the clock tower. We will start at the clock tower to receive instructions, then we will end up at the Caroussel for ice cream and a ride. Feel free to bring a sack lunch to picnic in the park! It will be a great night to come see what your kids have been doing all year. This event is being held at night for those families who have working family members and relatives who would like to see what we have been up to. The barista classes will offer their wonderful coffees and Italian drinks for sale and our Small Business Bakery class will have a silent auction with their beautifully decorated cakes. Come support your school's students! Displays of your students' work from a variety of classes will be available to enjoy and for parents and relatives to see what they have been doing. If your child wants to display a project they did in class, please have them bring it that night to share! After the celebration you may take your child's display home again. Silverwood "Reading Is the Ticket" passes will be distributed by Sue Bierce and "Summer Movie" tickets will be sold by Tamie Glubrecht. Summer movie tickets provide students with 9 family friendly movies for $5.00. We will have performances by our Piano, Guitar, Irish Dance, Gymnastics, and Fencing classes. If your child is in one of these classes, please make sure they are here for this night! It should be a great show you don't want to miss! This evening will provide students with their last required certified contact time for the year!! !